Interlaken is… one of my most favorite places in the world! It is beautiful, and when I talk about Interlaken, I do not necessarily mean just the town of Interlaken. The region of Interlaken in the Bernese Oberland is one of the best places to visit – ever! Here are the best hotels for all budgets and all areas (so you will also find some hot recommendations outside of the town center of Interlaken) Because sometimes the best hotels are not easy to find, and the best value for the money is off the beaten path. P.S. As a regular Interlaken visitor, who spends quite a lot of time here, I have listed the best things to do in Interlaken here. 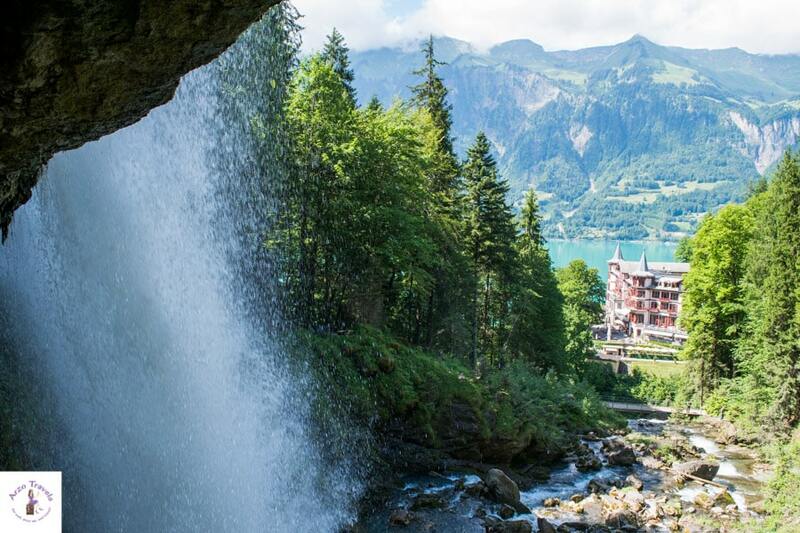 The most luxurious hotel in Interlaken is, without question, Victoria Jungfrau. The hotel is also very well known for its spa area and the formidable restaurants. 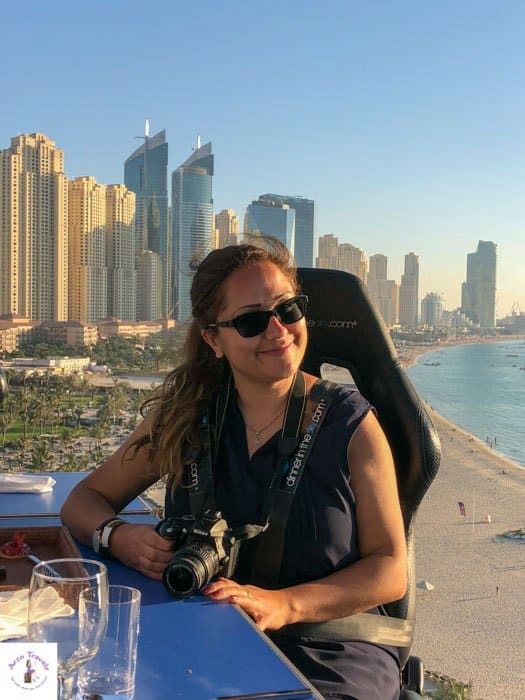 Though it is only a four-star hotel it is one of my all-time favorites (the service is the only thing that shows that it is not a five-star hotel, since there is no valet or concierge service helping you with your luggage). However, do not think less of this gorgeous property. It is probably one of the most unique ones in all of Switzerland. 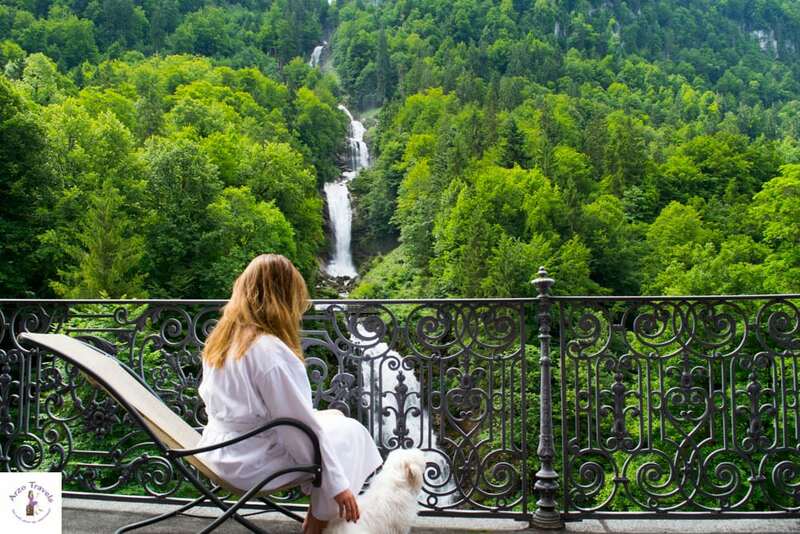 It is located at the foot of beautiful Giessbach Waterfall, and though it is not directly in the town of Interlaken, it is one of the best areas in the region to stay in. You can get there by boat; cruising Lake Brienz is probably the best way to get there since they even have their own boat stop. Or you can get there by car. If you book a room with waterfall views, it might be louder, but it will also probably be the best way to enjoy the surrounding nature. But a room view of Lake Brienz (one of the prettiest in all of Europe, and probably the world) is not a bad idea, either! Switzerland on a budget? Here are my budget tips for traveling Switzerland. 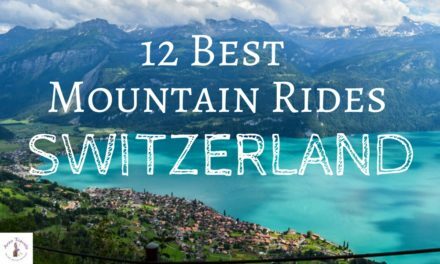 The most beautiful towns in Switzerland? 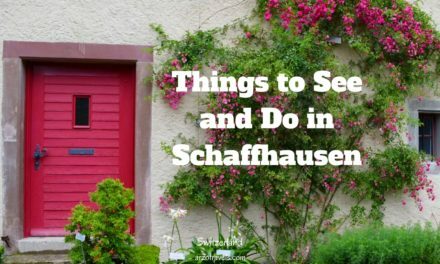 Here are my picks for the prettiest villages and towns in Switzerland. 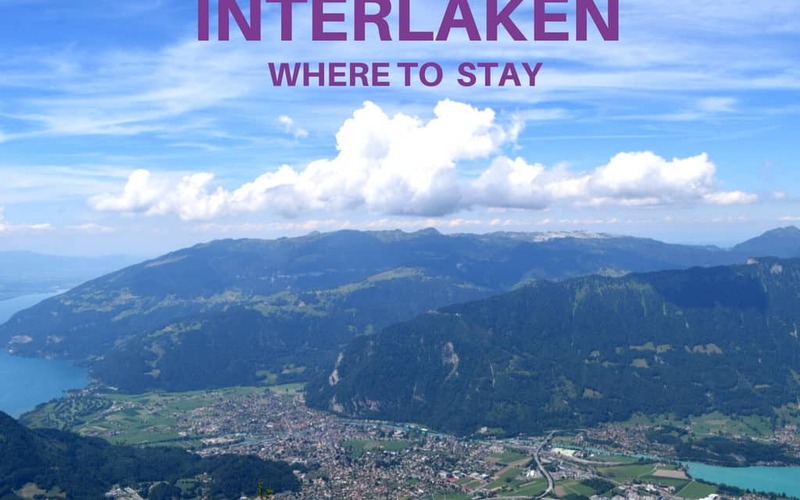 If you are looking for a 4-star hotel in Interlaken, then head to Hotel Interlaken. This lovely hotel is perfectly located for those who like to use public transportation (a few minutes-walk to the Interlaken Ost station), but would also enjoy a relaxing afternoon in the garden of the hotel. While it is quite simple for a hotel in this category, it is unique, as it has been hosting guests for more than 500 years! You can even get a cheaper room if you book one on the 5th floor, as this floor is hostel style! Of course, you have free wifi, but also free parking, which can be quite a help in Interlaken; and the restaurant downstairs is a good choice for dining. This four-star hotel is located in Swigriswil, high above Lake Thun, in a beautiful area in the region of Interlaken. Close to the suspension bridge (which offers great views of Lake Thun), you will find the weirdest, but cutest, place in Sigriswil, named Grabenmühle. Whether you book a room with a single bed, a double room, or a suite, you always have access to the saltwater pool, whirlpool, and the other facilities, like the fitness room. 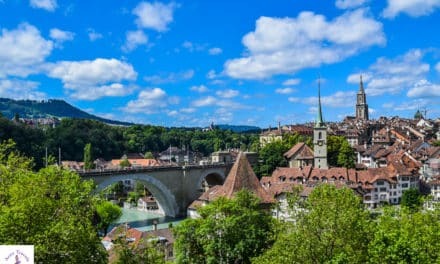 Looking for a perfect 5-day itinerary for Switzerland? I have it written down for you here. This lovely, three-star hotel comes with a view of the Bernese Alps and Lake Thun – another gorgeous lake in the region. It takes about 15 minutes to get to Interlaken and is a good choice for a vacation in the region. The family-run hotel welcomes its guests in a friendly manner, and the highlight is the garden area that comes with a view. Kids will love this area, but so will everyone else who does not need a fancy room and prefers nice, quiet surroundings! For backpackers, the Interlaken Youth Hostel might be ideal. 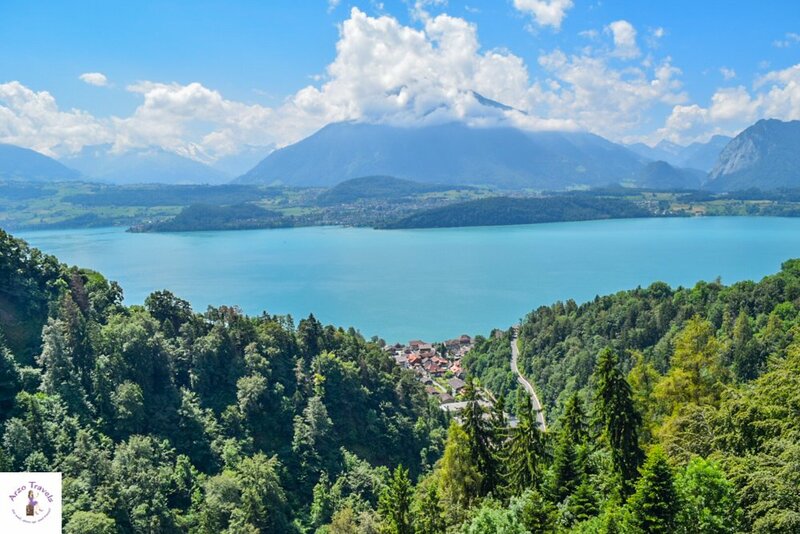 It is located right next to the Interlaken East Station and between Lake Thun and Lake Brienz and so it is super convent to get around (public transportation there is great, so no car needed). 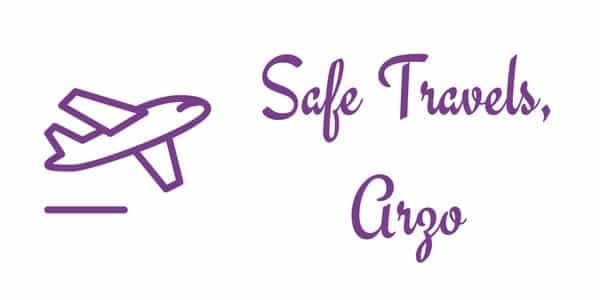 Though the room prices are not necessarily backpacker friendly (well, not nothing new about Switzerland), it is one of the most popular backpacker destinations in the region and great to meet other tourists and travelers from around the world. You can rent bikes, play billiards, or join a game of ping pong – so, a fun place to end your day.